HOME > Key Organization, Storage and Key Identifiers > Restroom and Bathroom Key Tags > Standard Rectangle Restroom and Bathroom Engraved Key Tags > Mens Restroom Key Tag - Standard Rectangle - 1 3/4" x 4 3/4"
Mens Restroom Key Tag - Standard Rectangle - 1 3/4" x 4 3/4"
To order this item with custom engraving on the back (like your company name & address) CLICK HERE. Our Engraved Mens Restroom Key Tags are made in the USA of indestructible 1/8” thick ABS plastic with a durable Acrylic Cap (top color). The cap color is .012” thick and will not wear off. These bathroom keytags have a high mechanical and impact strength, which means they will not break when dropped. The Semi-Gloss finish is attractive and simple to clean. Unlike other manufacturers, we DO NOT use inferior standard styrene. 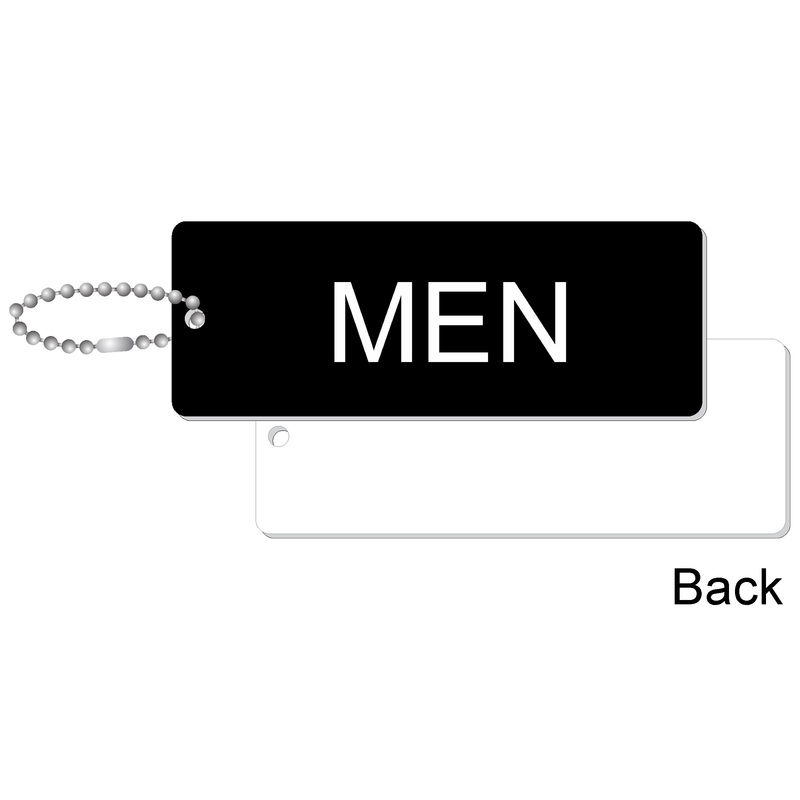 A large size sturdy plastic key tag for your mens room keys makes it harder to misplace or walk away with. The connector on the bead chain can be 'crimped' closed so that the key cannot be removed. Helps to prevent losing the keys to the mens restroom !. Engraved on one side only. 1 3/4" Wide x 4.75" Length. Custom Tags & Colors Available - Call. Mens Restroom Key Tag - Standard Rectangle - With Custom Back - 1 3/4" x 4 3/4"
Jumbo Rectangle Mens Restroom Silhouette Key Tag - 3" x 8"
Mens Restroom Silhouette Key Tag - Standard Rectangle - 1 3/4" x 4 3/4"